How can you measure client satisfaction in real time? 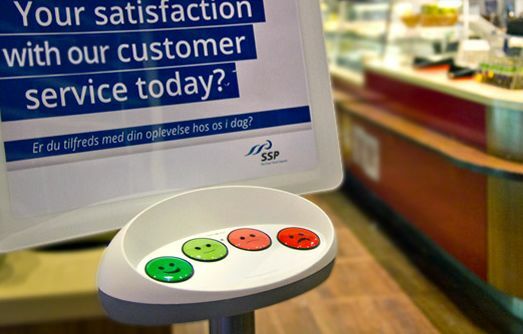 The Smiley kiosk is a tool that measure client satisfaction with mere expressive smileys that invite them to give their feedback about your poducts or services. The smiley face touch screen offers a way of putting client satisfaction at the heart of your commercial strategy. Client satisfaction can be measured in real time using this tool. The concept simply consists of installing self-service touch screens in strategic places such as shops or reception areas. 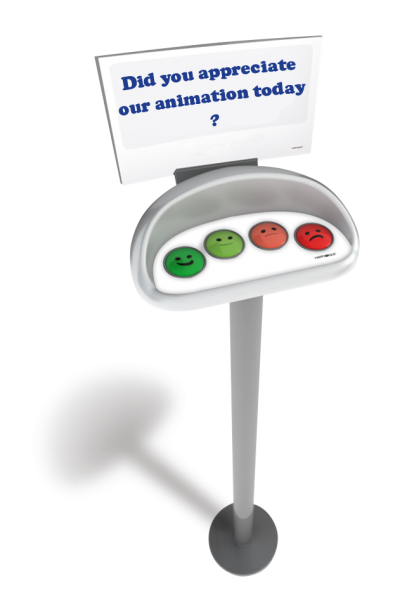 The clients and users answer a question about their level of satisfaction by pressing a button on the touch screen. The resulting data is sent and processed by the service provider and relayed to you the same day. It is up to you to choose how often you want to receive the data and how it is sent (to a department or just a few individuals, by mail or via a data server). We will help you to analyse the data and find practical solutions. What are the advantages of using this device ? Who Uses The Smiley Face Touch Screen ? DYMENSION also offers a tablet based solution for your satisfaction surveys and feedback requests, allowing several questions to be asked : EXPRESSYON. Unlike the previous solution, this kiosk works with Android touch tablets (from 10″ to 22″) or even on web browser on any kind of hardware. You can customize your own surveys through an online backoffice, and drop your poll on the tablet so tht it can work even offline. The users answer several questions in some touches, that allow you to profile them for instance. Than, the results are available online in the BackOffice or through email reports (as long as the tablet gets a connection back). What are the advantages of the kiosk ?